The Amelia Rix Award is held each year in memory of the late Amelia Rix who was a long-term participant in our Community Bridging Services (CBS) Inc. Jobnet Employment Program. CBS Inc. established the Award in 2003 for other Jobnet participants with a disability, who show similar determination and spirit to Amelia in finding and keeping a regular job in open employment. The event recognizes and acknowledges people with a disability who have achieved their goals through determination and perseverance. Nominees need to be successful in gaining employment and participate in other volunteer and community work. 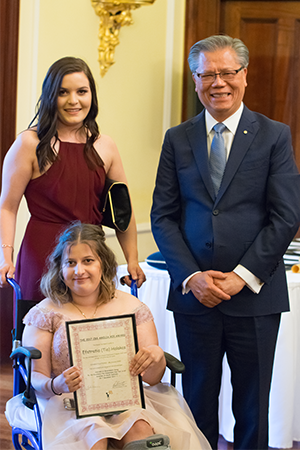 This year the awards were presented during a reception hosted by His Excellency the Honourable Hieu Van Le AC, Governor of South Australia, at Government House.There were a record number of nominees for the 2017 Amelia Rix Award – 15 in total – Carl Beauglehall, Tracey Coleman, Hannah Fabig, Michael Fragnito, Tia Halakas, Richard Hall, James Hillier, Paul Horan, Joshua Kniesberg, Ryan Mann, Tom Pride, Robert Reay, Janice Viney, Joanna Vowles and Zia Westerman. The winner of the Award received $1,000 and the runner up $400. 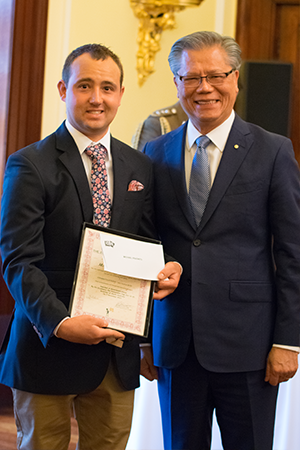 Encouragement Awards were also presented by His Excellency to several recipients. 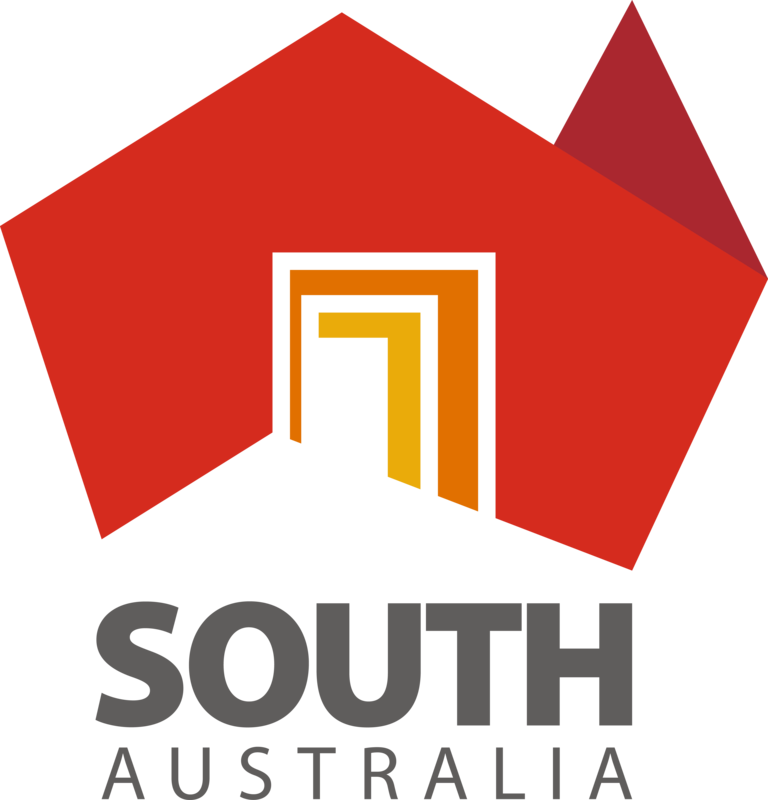 Approximately half of the nominees come from rural regions of SA, like Pt Lincoln, Port Augusta, Port Pirie, the Riverland and Whyalla. They are employed in a variety of fields, e.g. retail, medical research, education, administration, hospitality, promotions and their community work includes English tutoring, animal care, IT, sport and politics. 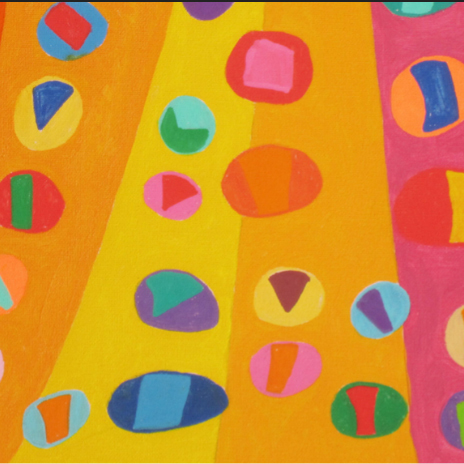 CBS Inc. is a recognised leader in the provision of support for people with a disability in the areas of open employment, further education, the arts and recreation. We are a not-for-profit organisation, with services in metropolitan Adelaide and rural & remote South Australia. We help people with a disability achieve job success by focussing on their strengths and interests. The generous sponsors of the 2017 Amelia Rix Award were also recognised at the ceremony. Tom has worked at Coles at The Avenues Shopping Centre for 6 years, where he does face up of items and assists customers with enquiries. Tom has exceptional knowledge of where each product is located in the store. Tom set himself a goal to complete Certificate II in Animal Care, achieved at TAFE SA Gilles Plains. Tom used this training for his volunteer role at the Nature Education Centre, located at Urrbrae, which helps to keeps animals and reptiles and has visits from primary school students. Tom is now completing his Certificate 4 in Youth Work, supporting his interest in social justice and goal of employment here in the future. It will also assist with his volunteer role of Sunday School Assistant with his church. Tom volunteers at the City of Burnside Library and he is responsible for their DVD collection. 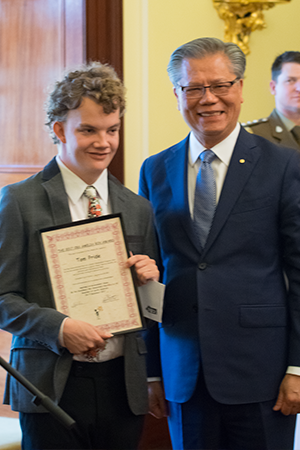 In recognition of all of Tom’s community service, Tom won the City of Burnside Young Citizen of the Year Award in 2014, which was awarded on Australia Day by the Mayor of Burnside. Tom was nominated by Bev Robertson from CBS Gilles Plains office. Tia commenced work as an Administration Assistant with Rosenthal Automotive, Berri, in June 2017. Tia is respected as a valuable, efficient and diligent member of the team and is regularly commended on her proficiency and commitment the job. 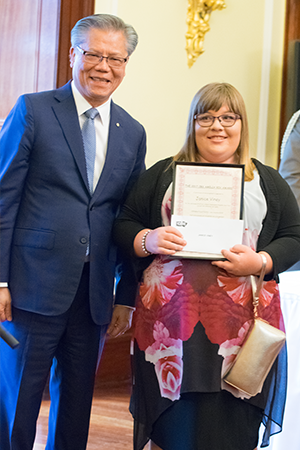 To gain employment, Tia set about increasing her skills by completing a range of programs, including Certificate II & III in Business Administration and Certificate III in Children’s Services. Tia is actively involved with the Girl Guides and volunteers at a school, supporting children. Last year Tia approached the Murray Pioneer (regional newspaper) to help make the public aware of the difficulty people with a disability have finding employment. Tia recently appeared in the newspaper again with the good news story about being employed at Rosenthal. Tia has helped to positively influence the practice of others, thereby increasing the inclusion of people with a disability. Tia was nominated by Kelly Watson from CBS Berri office. Carl has been working at Red Rooster in Murray Bridge since August 2016, starting working 15 hours per week as a kitchenhand and now regularly picks up extra shifts. Carl has gained his learner’s permit and is working towards his full driver’s license. Carl is a reliable and valuable team member in the workplace and is called upon to teach new staff from time to time. Carl volunteers at the Christian Book Shop Café in Murray Bridge, volunteers in his church and the local Men’s Shed. Carl’s volunteer work with his church has included a three week mission to Burma and he keeps in contact with friends there. Carl was nominated by Olivia Doecke and Wayne Kuhn from CBS Murray Bridge office. Tracey has been employed at the Challa Gardens Primary School since 2016, working with children with disabilities, and moved to the Challa Gardens Parent Centre in 2017. To achieve her goal of being employed as an SSO (Student Support Officer) with the Department for Education & Child Development (DECS), Tracey initially volunteered at Ocean View College as an assistant SSO and the Adelaide West Special Education Centre as a Disability Support Worker. Tracey successfully completed Certificate III in Education Support and a Certificate III in Children’s Services, both conducted at TAFE SA. Tracey now does some volunteer work at the Challa Gardens Primary School and the principal and staff comment that Tracey “Is part of the furniture but more like part of the family”. Tracey was nominated by Sherree Biddle from CBS Port Adelaide office. Hanna works at Lifetime Support Authority, providing administration support in the finance area. She will be entering a new role in projects in the near future. Hannah is continuously learning and growth is important to her, having completed various certificates including: Certificate IV in Community Services Work; Certificate III in Photography and Digital Imaging; and a Radio Broadcasting Certificate. 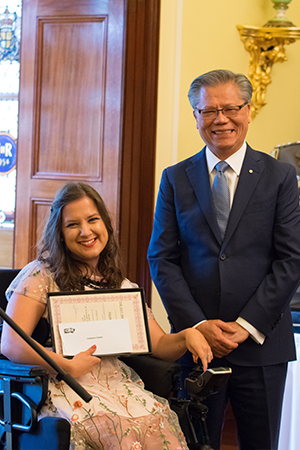 Hannah is inspired and passionate about providing awareness about disability in the community and is currently part of the Young Women’s Leadership Program – Every Girl, which is run by the YWCA. Roles include attending schools to educate young women and leading change. Hannah is part of Project Able, a small group which educates school children about disability. Other voluntary roles include: Community Visitor, visiting elderly residents; Adult Literacy Group Tutor, providing one on one tutoring in reading and writing; and Leader of a kid’s club vacation centre. Hannah was nominated by Mai Nguyen from CBS Adelaide office. Michael works in the butcher section at Festival City Foods, Albert Park. Michael achieved his goals of getting his driver’s license and buying his own car so he could be more independent. His next goal is to save for a deposit on a house. Michael does voluntary work at the Nature Education Centre, looking after the animals there and also provides gardening work for elderly family members. Michael approaches all of his goals with passion and hard work. Michael was nominated by Bev Robertson from CBS Gilles Plains office. Richard is currently employed as a Football umpire, Junior Tennis Coach and SANFL Game Development Officer, beginning paid employment as a field umpire in October 2016 with the AFL 9’s competition. Staff there were impressed with Richard’s ability and attitude towards umpiring, recommended Richard as an umpire to both the Adelaide Footy League and SANFL Juniors League. Richard is also employed as a Tennis Coach in primary schools, visiting schools and community events teaching children to play football and promoting the game. 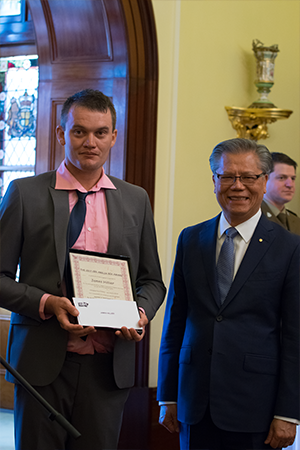 Richard’s main goal is to gain full-time employment in the disability sector, after successfully completing Certificate III in Individual Support. He currently volunteers with Disability Recreation and Sports SA, assisting with the No Handicap Golf Club, an initiative to provide a fully inclusive environment for people with a disability to play golf. Richard is an active volunteer with Cara, assisting children with a disability participate in the Kidz Club. Richard was nominated by Laura Birchmore from CBS Kilkenny office. James has been employed with Alpha Satellite Dish as a Trolley Collector at local supermarkets since December 2015, a position gained after a successful work-experience placement. James has been actively involved with his local community since high school, including working at the Junction Express Café and Meals on Wheels. James completed Cooking 1 and 2, a program which has taught him supermarket shopping and cooking healthy meals. More recently, James has volunteered in the Country SA Food Hub in Port Pirie, assisting in stacking shelves and unloading supplies, to help those in need. James was nominated by Evelyn Dumoi from CBS Port Pirie office. Paul has been working for Passing Out Distributions since January 2017, delivering promotional material to various employers in the Adelaide CBD and is also working for Orana for the past 12 years in both a paid and voluntary capacity, including at one of Orana’s Op Shops. 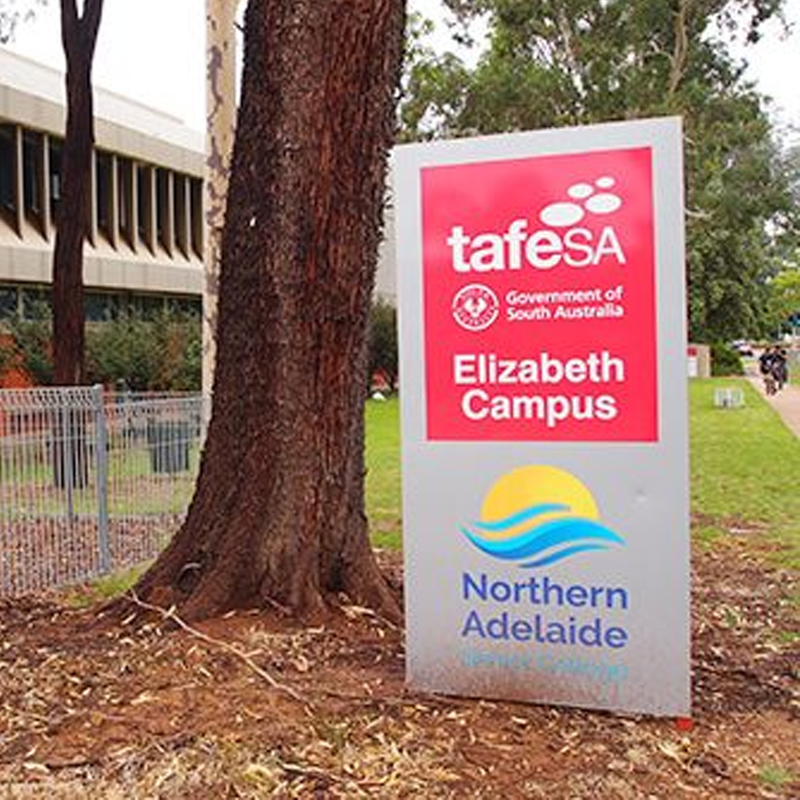 Paul has completed a range of further education programs, including Certificate II and III in Information Technology, and has a previous Bachelor of Science. He is interested in eventually going back to Uni to complete either a Diploma in Mathematics or Diploma in Statistician. Paul attended the CBS Work Ready program and Job Focus groups held at our Port Adelaide office, also participating in the CBS Quality Assurance audits. Paul is a key member of the SA Chess Club, attending weekly and volunteers in setting up. He also has taught himself how to play the guitar from an online website. Paul was nominated by Elisa Bozanic from CBS Port Adelaide office. Joshua has been working at Domino’s Pizza in Port Augusta since March 2017. Working hard to gain his Ps, Joshua purchased a car and gained confidence in driving that he now completes work delivery duties. CBS assisted Joshua learn GPS map reading and he now drives all over the city of Port Augusta. The Area Manager at Domino’s said that the best thing they did was to employ Joshua, which is an exceptional compliment to his work ethic. Joshua is always willing to give things a go. He is an active member of his church, assisting with the weekly cleaning schedule and travels to church in Whyalla monthly to join in the service there. Joshua was nominated by Liz Moore from CBS Port Augusta office. Ryan works 20 hours per week at SAHMRI (South Australian Health Medical Research Institute) as a Special Projects Officer. Ryan made it his mission to not only overcome any obstacle that life brings, but to also support others in similar situations, to achieve greatness. Ryan has become a successful advocate and fundraiser for Spinal Cord research, and this included the creation and facilitation of the Neil Sachse Centre 2017 Race Day. Ryan also participated as a Board Member for this foundation. Ryan is also an active member of the Dignity Party and has represented Kelly Vincent MLC at a number of community functions including the CBS Noarlunga office opening. Ryan was nominated by Katherine Rose from CBS Warradale office. Robert has been employed at Woolworths Port Lincoln since January 2017. During this time Robert has shown his versatility by working in various areas of the store. Robert reached his goals of obtaining his Learner’s permit and purchasing a motorbike so that he could get to work. As a result he has gained more shifts due to his increased availability. During Robert’s time at CBS Jobnet he has been involved in Job Pit and also the Work Ready Program, which led to work experience at Woolworths. Through Robert’s application and commitment to his work experience, he was recognised by the Manager and offered paid employment. Robert has become a valued member of the team. Robert has been involved in community activities, including volunteering at the RSL and actively participating in the Salvation Army Church Youth Group and the Thrift shop. Robert was nominated by Margaret Collett from CBS Port Lincoln office. Jan has worked at Produce Discounters, a fruit and veg wholesaler in Port Pirie since July 2016 and has never had a sick day. She works five evenings per week, after the store closes, preparing it for the next day’s trade. Jan always arrives early for work and has the routine down pat. Jan has a long history of community involvement in the Port Pirie since 2014, including volunteering with the Community Food Hub, helping disadvantaged people. Jan is an avid tenpin bowler and a proud member of the Port Pirie Tenpin Bowling League and is currently saving for her own bowling ball, bag and shoes, a goal she has nearly reached. Jan was a member of the Port Pirie District Hockey Association for three years, playing for the St Andrews Hockey Club as goal keeper. Jan was nominated by Garry Newman from CBS Port Pirie office. Jo is a current IPS (Individual Placement and Support) client in the Riverland. Shortly after being linked with CBS and the IPS program, Jo started with Country Health SA. 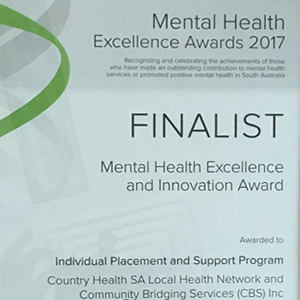 Jo works in administration, across all departments in the hospital and community health centre, doing such a great job that Jo is consistently being put forward to complete other training programs to widen skills. Jo always sets herself personal goals and recently purchased a brand new car. Jo has a positive attitude and her motto is “onwards and upwards”. Her long term goal is to complete study in Social Work. Jo volunteered in Thailand, teaching community English classes to all age groups with Global Vision International. Later Jo won a position in Nepal, coordinating volunteers who came to the region. Jo went on to arrange public speaking gigs for the Lions and Rotary Clubs about her experiences and appeared on the local ABC radio and local newspapers, to promote the programs. 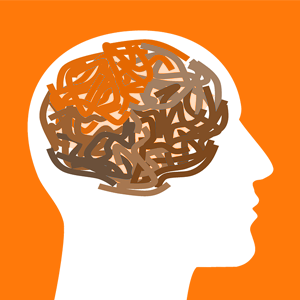 Jo is currently the Deputy Chair for the Friends of Mental Health group in Berri. This is where service groups, consumers and carers meet to discuss improvements to services to people living with mental illness. In 2016, Jo volunteered for 12 months as a trainer with the Barmera Monash Football Club, assisting players with injuries and applying first aid. Jo was nominated by Peggy Mills from CBS Berri office. Zia worked with the Whyalla City Council, and was based at the Community Library, originally employed as a Library Assistant but then progressed to assist with council projects. Zia has a passion for writing and has undertaken study in Creative Writing and is a member of the Whyalla Writers Group which meets monthly. Zia contributes in updating and managing the website and in 2016 they published a book called “Tales of Cuttlefish Joe”. Zia has provided services through her own business “Wondrous Words of Zia”, assisting people with resume writing and proof reading documents. Zia is involved with the Whyalla Youth Advisory Committee (YAC) contributing to youth projects through the Whyalla Council, providing advice on how to make the city accessible for people with a disability. Through this, the council was able to secure beach mats, making the beach wheelchair accessible. Zia is always looking for new opportunities to learn and contribute to the community. 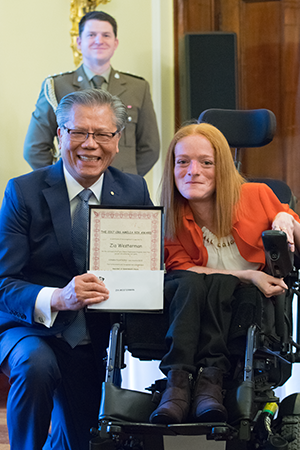 Zia is building on experiences working with Disability SA and the Dignity Party, and has fostered both a professional and personal rapport with Kelly Vincent MLC. Zia was nominated by Anthony Cooper from CBS Whyalla office. Congratulations to all of the Nominees and thanks to all staff for their nominations!